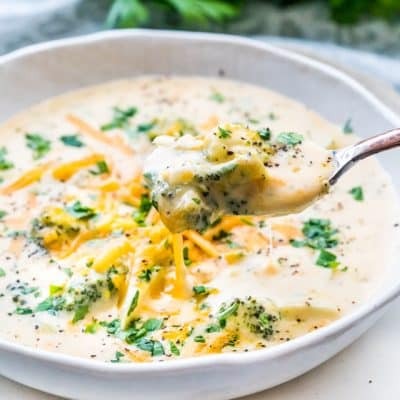 This Broccoli Cheese Soup is creamy, super cheesy, quick and easy. The best part is that you can have this scrumptious soup ready in 30 minutes. 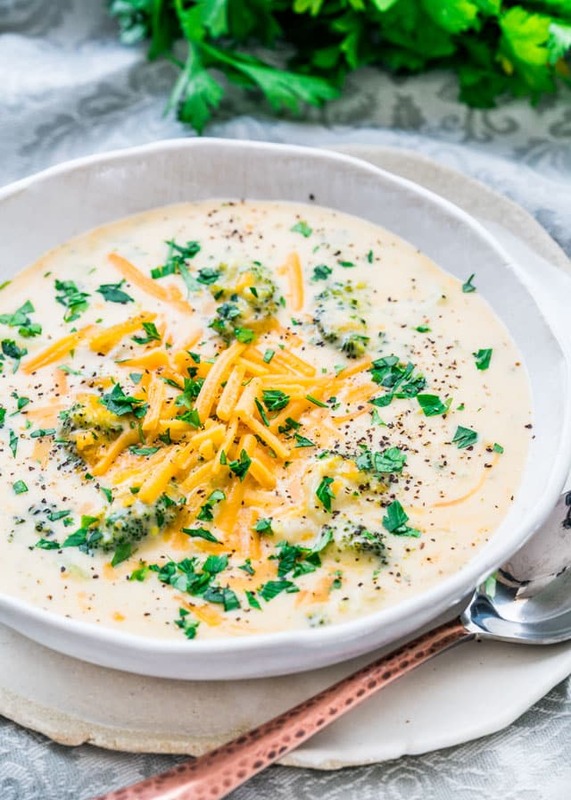 I admit that broccoli cheese soup is one of my favorite soups and trust me when I say it’s not the broccoli so much as that cheesy creamy sauce. 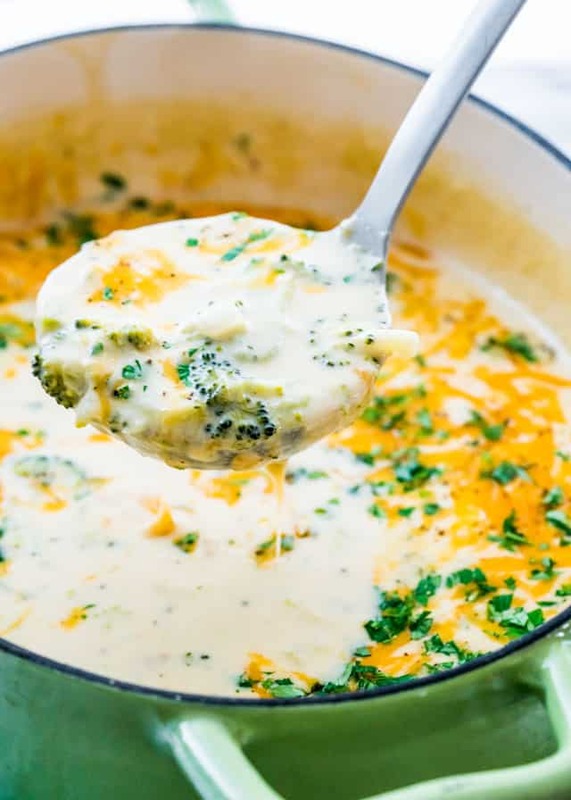 Because let’s face it, broccoli cheese soup is really a cheesy sauce with broccoli thrown in it, why? Perhaps to make us feel better about eating all that cheese. However, broccoli really does go well in this cheesy soup and yes, it does make me feel better about eating it. While I know it’s not a true vegetarian soup because of the chicken broth in it, in my head I’m eating vegetarian. It’s how I trick my mind. However, if you did want to turn this into a vegetarian soup, just use vegetable stock instead. But why is this soup so good and why are so many of us obsessed with it? It just is. Once you try it, you’ll get hooked. It’s just as addictive as my Creamy Loaded Potato Soup! Now let’s talk about the ingredients in it because there’s one ingredient in it that I’m not so proud to use. But I’m willing to take all the flak from you, only because I think Velveeta is a must in this soup. I know, hate on me all you want, but it’s what makes this soup so creamy and smooth. Of course, you always have the choice to not use it and substitute it with more cheddar cheese or some good Monterey cheese, and while it will still be a very delicious soup, Velveeta will just take it to the next level of creaminess and smoothness, if you know what I mean! There also is lots of cheddar cheese and of course broccoli in this soup, so it’s not all bad. You can also make this a bit healthier if you chose to by using milk instead of half and half. However, if you’re going to make broccoli cheese soup, I suggest you go all out and enjoy it as it’s meant to be enjoyed. Creamy, cheesy and delicious! Super simple. Start by sautéing the onions in a lot of melted butter. Whisk in the flour, this is like making a roux. Add the half and half cream and stir so there are no lumps. Add in your seasonings. In goes the broccoli and cook for a few minutes. Then add the cheeses. Serve this with some crusty bread and you’ve got yourself an awesome meal! Melt butter in a large Dutch Oven over medium heat. Add the chopped onion and cook until softened and starts to lightly brown. Sprinkle the flour over the onion and gently whisk it with the butter and onion. Cook it for about 2 minutes to remove that raw starchy flavor. Slowly whisk in the half and half. Once completely mixed in, pour in the chicken broth and whisk to remove lumps and to scrape away the browned bits from the bottom of the pan, if any. Season with salt, pepper and nutmeg. Bring the mixture to a boil then add the broccoli pieces. Cook until the broccoli is tender; about 10 minutes. Add the velveeta and 2 cups of the cheddar cheese, stirring constantly until the cheeses have completely melted. Taste for seasoning and adjust as necessary. Top with remaining cheddar cheese and garnish with parsley. Half and half, also known as half cream is a blend of equal parts whole milk and light cream and it averages 10 to 12% fat. If preferred, you can puree the broccoli in the soup for a thicker texture, but I prefer the bigger florets in the soup. * If you don't want to use Velveeta you can substitute it with more cheddar cheese or Monterey Jack cheese, it's just that Velveeta will make the soup more creamier and smooth. You can also use pre-cut fresh or frozen florets. Store leftover soup in the fridge for up to 3 days. Reheat over low heat to avoid scorching. 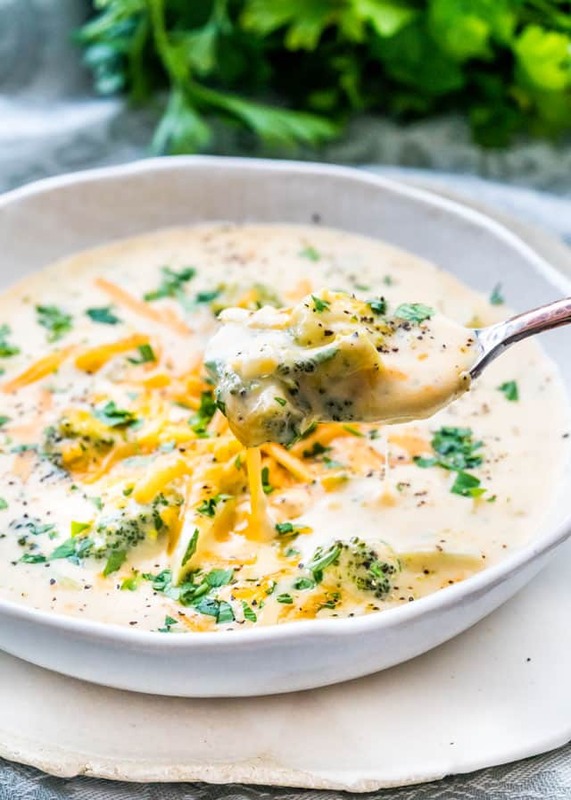 This soup tastes exactly like Panera’s broccoli cheddar soup! It’s so good and easy to make! I just purchased a instant pot .and wonder how to prepare this soup in it. I really like this recipe of yours but.. not sure how to proceed. Would enjoy receiving some tips from you..
Use 5 cups of broth and 1 3/4 cups of cream. You can cook everything in the Instant Pot on high pressure for 5 minutes. Add the cheese at the very end after you’ve released all the pressure. I just made this and it is absolutely DIVINE! Thanks for another fabulous recipe! By far the best broccoli cheese soup I’ve ever made. Thanks for sharing. I can’t wait to try this! Thank you!